“The New Age Magazine” was a national monthly devoted to literature, science and Freemasonry. More exactly, “The New Age” was the official organ of the Supreme Council of the Thirty-Third Degree of the Ancient and Accepted Scottish Rite of Freemasonry for the Southern Jurisdiction of the United States of America. Headquartered in Washington DC (but with its magazine being printed in New York City), the “Southern” jurisdiction actually covered both the southern and western parts of the United States. Or covers, since this particular organization still exists. This volume contains issues of “The New Age” published in 1913. It's not clear whether the magazine was an members-only publication or a public organ, since the purpose of the magazine was said to be promotion of Scottish Masonry among “rank and file members of the Craft”, i.e. non-Scottish Masons. The frequent subscription drives suggests that the magazine was also intended for the general public. Many of the articles are general-interest stories, of the kind found in regular magazines or Sunday supplements to daily papers. Thus, there are articles on Tzu Hsi (the Empress Dowager of China), counterfeiting, “lobster palaces”, the jewellery of Indian maharajas and American-sponsored schools in the Philippines. Many articles deal with charitable projects, such as schools for “the deaf and dumb”, hospitals or help for the homeless. A millionaire named Brown apparently travelled across the United States, disguised as a tramp, on a fact-finding mission. Other articles deal with opera or theatre plays. A play about Franciscan mission houses in colonial California is positively reviewed, somewhat surprisingly due to the ingrained anti-Catholicism of this magazine. “The New Age” also published political articles. A serialized work about Garibaldi is titled “The Flame of Freedom”. An article by “An Armenian” expresses support for both Muslim constitutionalists and Nestorian Christians in Persia. The latter had been persecuted by Russian Orthodox priests who arrived in the town of Urmia during its occupation by Czarist Russian troops. The article is illustrated with authentic photographs of executions, triumphant Orthodox priests confiscating a Nestorian Church, etc. “The New Age” also opposed the military dictator Huerta of Mexico. However, it seems that the liberal progressivism of the Southern Jurisdiction had its limits. A photo of its large “temple” in Dallas, Texas shows the Confederate flag prominently flying from its roof! I already mentioned the anti-Catholicism, with the magazine promoting a book with the ominous title “Romanism, a menace to the nation”, and an ad for books on Freemasonry, Anti-Popery and Eugenics. Apparently, the promotion of Father (sic) Crowley's “Romanism” created some consternation among the Masonic faithful, with several readers writing letters of protest. Rather than budging, the editors published a letter from an ex-Catholic, accusing the Jesuits of infiltrating Masonry! While only men (White men?) can become “Scottish” Masons, “The New Age” had no problem using the services of women as article writers. The wives and female relatives of Masons were also called upon during a subscription drive. It's interesting to note the gendered prizes for those who recruit most subscribers: males get bicycles, gold watches, jewels or a life subscription to “The New Age” (sic), while women get pianos, suction sweepers or sewing machines (but admittedly also gold watches and diamond rings). The grand prize in the contest was a car, presumably for both sexes. Since “The New Age” was a Masonic organ, it obviously contains pieces of interest only to Masons, including ridiculously detailed descriptions of Masonic temples (including the one in Dallas) and various celebrations. The editors are somewhat disappointed by the fact that state governor Hanna didn't attend the celebration of the thirtieth anniversary of the establishment of the Scottish Rite in Fargo, North Dakota. There are also articles speculating about sacred geometry, or covert Masonic symbolism in the architecture of Venice (that's Venice, Italy). 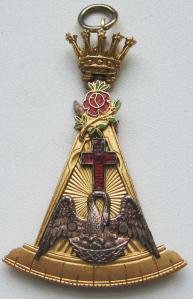 It's interesting to note that the names, titles and positions of Masonic officers were public. Thus, we can read that a certain William J Fish was “Wise Master” of the “Butte Chapter of Rose Croix, no 8” in Montana. Genealogists might find this interesting! “The New Age” could be of considerable interest to cultural historians, historians of Masonry, and, I suppose, Masons. This review is based on two issues only, but they covered over 200 pages! Also available on the web, if you can stand screen-reading.